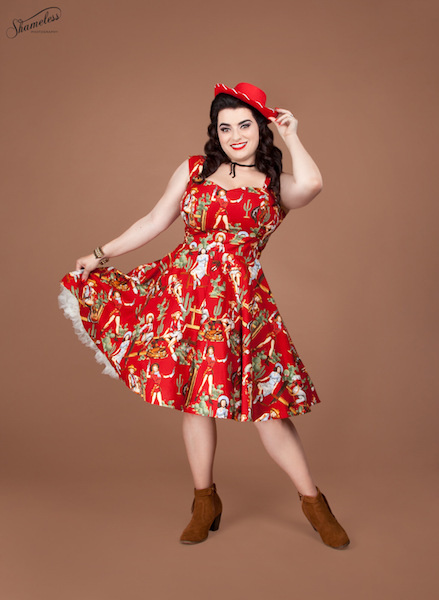 I had been in search of a cowgirl novelty print swing dress for quite sometime and when I saw this Pigtails and Pirates Ride’em Cowboy stunner I had to have it. 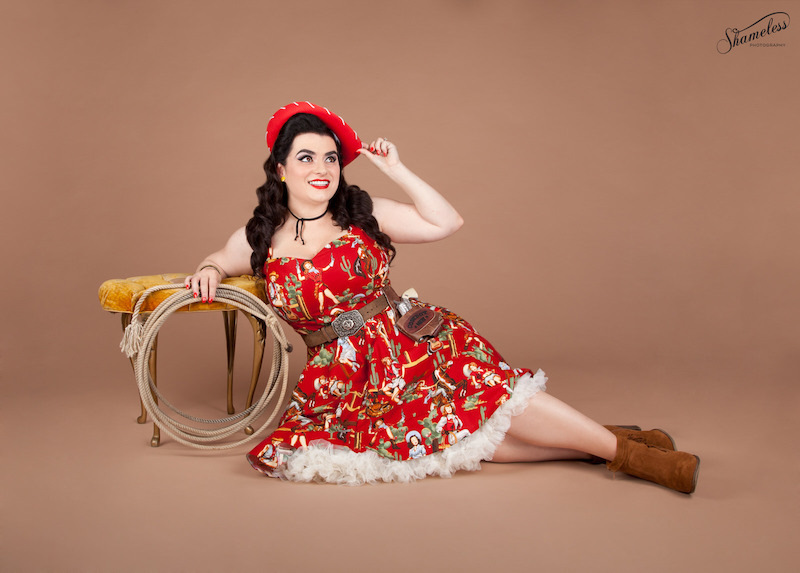 The color is a deep vibrant red patterned with vintage pinup cowgirls in a variety of poses and settings. The sweetheart neckline is so feminine and figure flattering and accommodates a full bust nicely. The straps are also a nice size so you can wear your regular bra underneath. The dress arrived very quickly all the way from Australia (I am in California) and was packaged with great care, it arrived just in time for a photo shoot I had been planning. 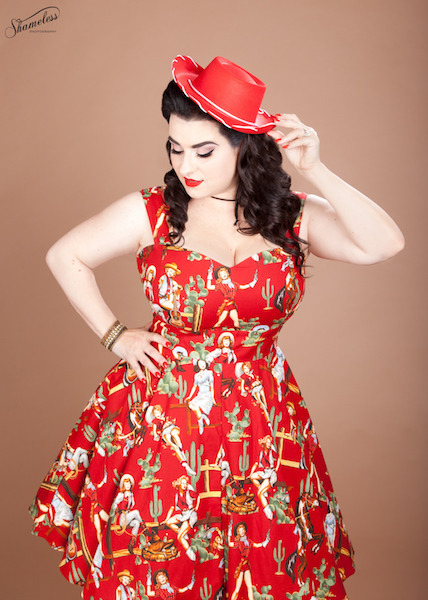 For the shoot I styled this adorable cowgirl dress with a fun cowgirl hat and vintage lasso. I am wearing a petticoat for added flair though the swing skirt is a nice full size on its own. If you are not familiar with the Pigtails and Pirates brand you really need to get acquainted as owner Laura crafts beautiful 1950s retro silhouettes in the hottest mainstream themes from superheroes, comics books, fairytales, pop art, Hello Kitty, florals, flamingos, geek chic, photography, nautical, evening and formal wear and so much more. Pigtails and Pirates also has a children’s clothing line for infants, girls and boys; you really need to check out the mother-daughter matching outfits…. so cute!! Pigtails and Pirates has a great tagline ‘Awesome People Wear Awesome Clothes’ and if you want to stand out in a crowd and receive nothing but compliments in your colorful, fun and flirty retro pinup girl dresses then hurry and head on over to the site and you will see for yourself that there really is something for everyone and sizing is a wide range too from 6 – 18 Australian. For reference, I am wearing the size 18 to accommodate my bust. Custom orders also welcome at Pigtails and Pirates so if you see something you like that is not in your size do not be shy to ask. Hurry and checkout Pigtails and Pirates and let me know what are your favorites!! My cowgirl set here + MUAH are all by the fabulous team Shameless Photography. Stay tuned for more as I will also write a post about the out-of-this-world Rocket Rascal’s dress by Pigtails and Pirates and the photos really are amazing…. it was an incredible shoot with Shameless Photography.